This program has grown from a one week summer pilot in 2013, to the project-based, STEAM focused, Summer Art & Design Thinking Camp. The camp engages middle school youth in exploring design thinking processes, digital tools, and visual arts. Campers work individually and collaboratively as they experience art in a very engaging, dynamic, and innovative way. Campers present their projects at a weekly showcase, which provides an opportunity for campers to explain their design processes and receive feedback from family members, professionals, artists, and staff. Each week of camp has a different theme and the camp day is divided into two parts. Focused Learning occurs in the morning, where campers participate in activities that introduce them to the skills they will need for each week’s projects. Campers use Maker Journals to document their process and learning. Guest artists and speakers are introduced during focused time to give campers breadth and depth on art styles, as well as to careers and opportunities in various fields of study. Afternoons are dedicated to Tinker Time. Campers are able to choose whatever activity they want, including working on each week’s projects. Campers plan their activities in their journals and later check off completed tasks, noting where their tinkering took them. They can delve into bot creation, sewing circuitry, CAD design, 3D printing, and gaming design in Scratch, and many other activities. A variety of resources, tools and materials will be available to them in this self-directed exploratory time. Some of the software tools used are: Scratch, SketchUp, Sculptris, Inkscape, Audacity, Movie Maker, Repper, and Tinkercad. Included in the tools accessible will be MakeyMakey, Little Bits, Cricut, Strawbees and Quirkbots. The projects provide campers the opportunity to practice and enhance their academic skills, and while the projects all have academic components, the focus is on the process and art exploration rather than the end result. Focusing on STEAM projects stimulates creativity while allowing campers to develop their artistry, encouraging them to think outside the box and follow their ideas in directions that their passions take them. Below are some of the skills badges campers can earn by mastering specifically assessed skills. Badges are awarded at the end of each camp week. Campers will have the opportunity to learn skills during both Focused Learning and Tinker Time. 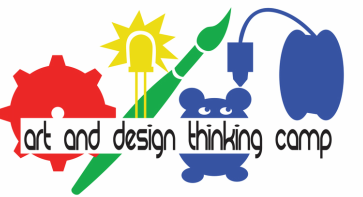 Here is the website for the pilot 2013 Art & Design Thinking Camp. Here are links to the 2014 Art & Design Thinking Camp and Slideshow for 2014 Camp. Information on the 2015, 2016, 2017, and 2018 camps can be found under the ABOUT tab section heading.